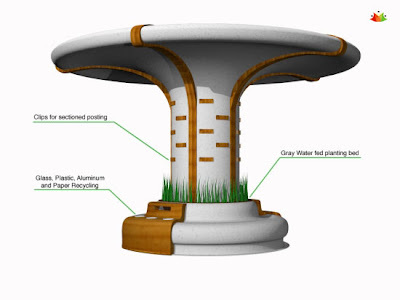 Picking up some threads of a recent post about some inventive site furnishings, as well as the ongoing obsession with Vegetated Architecture brings another melding of the two. 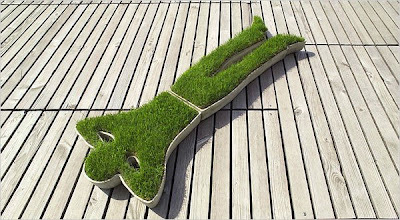 A range of vegetated furniture that ranges from the purely decorative to the downright functional. First, a quick shot from Michael Cannell's blog at Dwell - with some unique seating spotted at the Milan Furniture Fair. 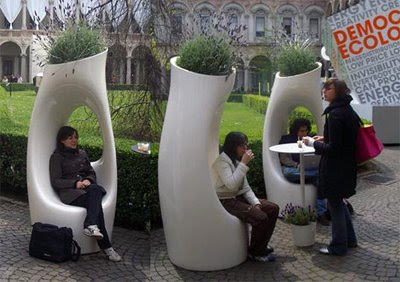 A bit more functional are a couple of examples of GYO furniture, via Inhabitat. First is the TerraGrass Armchair kit featuring a cardboard frame that is filled with soil and planted for a comfy looking overstuffed chair. 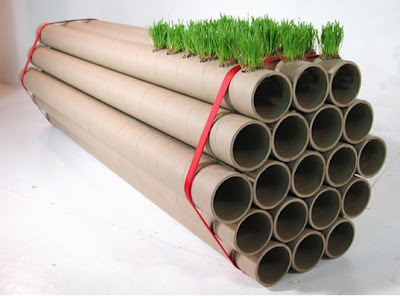 And another from designer Julian Lwin, via Inhabitat: "The recycled cardboard cylinders of the new “Ephemeral BioTube Bench” are embedded with seeds using a cellulose liquid, so that as they are exposed to moisture, rain and light, they biodegrade (to a rich mulch layer) and turn into an instant garden." Taking this to other forms of furnishing, a table with a built-in-trough for some sort of vegetation - we'll call it a living centerpiece. 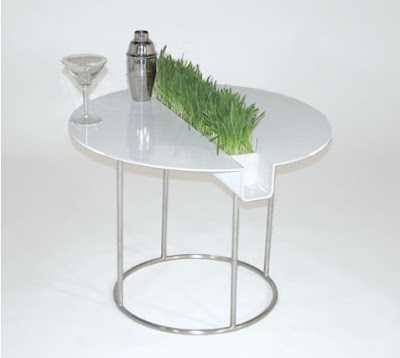 'Side Table' is by designer Jonas Hauptmann - as seen on The Design Blog seems perfect for a stand of cut-your-own lemongrass, or perhaps a nice area for someone to hide those brussel sprouts. :: image via Hauptmann Products Inc. 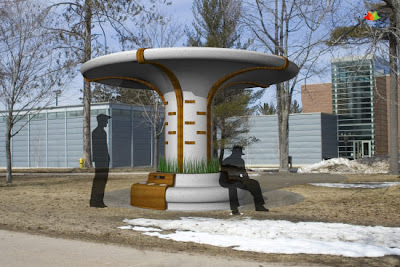 Taking functional furnishings a bit further, GreenU, by Andrew Volpe, a student at the Northern Michigan university envisions a self-contained and self-sufficient shelter, information kiosk, seat, recycling/trash receptacle all in one handy, sustainable, easy to assemble vegetated unit. Maybe the artful inclusion of vegetation into the idea of furnishings can avoid the inevitable wardrobe changes that may be necessary to comfortably occupy urban spaces. 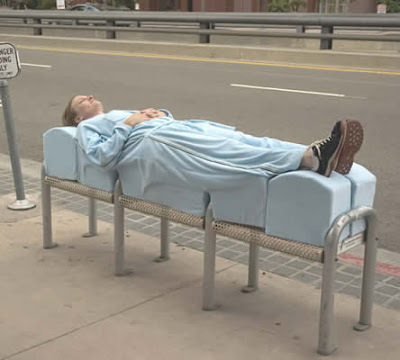 While a tad tongue-and-cheek, there is some social commentary associated with Archisuits by Sarah Ross - which meld fashion, function and localism to accomodate the specific seating barriers in Los Angeles.